We first met Water of Life Community Church in 2010. The church, then meeting in a multi-purpose gym-natorium, engaged us to create a hybrid high-definition Virtual Pastor experience. As the church grew, we continued working with them as they opened a regional venue across town delivering video teaching from their main campus. When the church decided to redevelop their entire campus, we were once again invited be part of their journey from discovery to reality. Water of Life Community Church is committed to being highly integrated in their community. In addition to their weekend services, they have a school on the campus as well as numerous programs that run day and night throughout the week. While the new facility was to be packed full of technology, it also needed to be a flexible space that could easily transition to support all of their activities. The deeper we dove into the project, expandability became the theme of this system design. 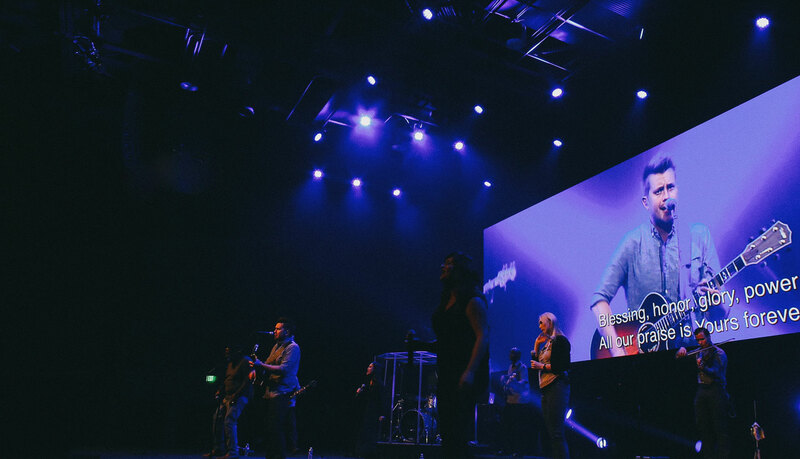 We constructed an audio system that was capable of handling today's pop worship style along with a video and lighting system that could continue to grow and evolve over time. Additionally, the entire system had to be designed for a volunteer centric workflow. Despite several changes in technical direction, budget and construction delays - including seismic issues based on the California location of the physical facility - one thing that always remained the same was the opening date. No matter how many delays came into play, changing the opening date was out of the question, and together we successfully navigated a way to honor that commitment. All of the technical components of the system were chosen to maximize longevity and minimize required maintenance in order to emphasize the strategy of sustained excellence for the church. All elements of the system are capable of connection to the Guardian by Mankin network operation center for real-time support during services and events. Inside the Water of Life main auditorium, the broadcast video system is comprised of Ross Carbonite switching, Imagine Platinum VX routing, Hitachi cameras, and various source and capture equipment, providing high performance, high value, and high overall bang for the buck. A Christie Spyder video processor provides image processing for a huge 44’ by 13’ CreateLED LED wall that is the visual anchor for the entire space. The theatrical lighting system is a mix of Chauvet LED ellipsoidal and wash fixtures plus Martin Aura moving head LED wash fixtures, controlled by a Martin M6 lighting console with MDG haze. The concert level audio system is comprised of a L’Acoustics Kara loudspeaker system, Midas consoles at FOH, Monitors and Broadcast, and Shure wireless mics and in-ears. Clearcom Matrix intercom rounds out the technical systems. In the end, the technical systems were an incredible achievement for the church and nothing like they had even seen before in their services, which required a significant culture shift for their technical team. The staff at Water of Life excitedly took to the new systems and have been able to continually raise the bar on production with this exceptionally flexible system. The opportunities to help the church fulfill their mission in the early days were just as important as those today, and we’re fortunate to be a part of Water of Life’s story.